This is a claim of Mr. Rowe- he does not speak for the atheists of the world, and his assertions fly in the face of modern usage within the active non-religious community today. Here, Here, Here, Here, Here, and Here are just a few examples. 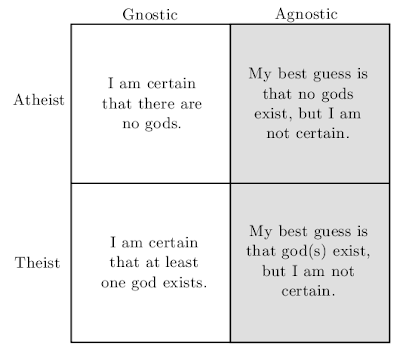 As commonly explained, 'agnostic' vs 'gnostic' deals with the epistemological question of knowledge, while atheist vs theist deals with the question of belief (e.g. regardless of what you know, do you have or lack belief in it). Atheists DO NOT disbelieve in god. SOME of them disbelieve, others simply lack an affirmative belief. As I have said, liberally, some of them even positively BELIEVE in something like a deity, but merely do not worship it or claim to have a relationship with it. This is a minority of atheists, however- most simply lack belief (but do not actively disbelieve). MOST atheists identify as "agnostic atheists"- neither believing nor disbelieving, having not seen evidence in favor of believing, they lack belief in a god, but do not claim to know, or actively disbelieve. In other words, if Mr. Rowe made this claim in the last five years, he is either ignorant of modern developments, or is being dishonest and frankly rude with his usage of the word "disbelieve" for atheists- because self identifying atheists largely reject that label. Since he's 82, I think we can give him the benefit of the doubt in saying he probably has no idea what has transpired in the past ten years. Please don't be one of those people who wants to tell us all what we believe, as if you know better than we do what's in our heads. Doing that makes you no better than those Christians who claim that we all secretly believe in god but hate him and chose the devil instead- in fact, worse. If you feel the posts you want to make relate to religion, atheism, or theism (whether it's for or against atheism or theism as you see it), then make it in the Atheist vs. theist place. If it's another topic, then put it in off topic. I'm sure you have some interesting things to say, and I'd look forward to reading your posts, but please respect us when we explain clearly what we believe, and how we self-identify. The closest you can come to being "true neutral" is by being an agnostic atheist or agnostic theist depending on how your day is going. Some people waver constantly between believing and not believing, but never claim to know. In no way does "atheist" express or imply active disbelief, or affirmative rejection, of any deity. This is another place where definitions are important. Before you decide what kind of believer or non-believer you are, you need to decide what the definition of God is. Walter Kaufmann wrote: One's strategy in trying to defend or to attack the claim that God exists obviously depends on what is meant by "God." It may be objected that it is not so difficult to isolate what might be called the popular conception of God. The problem of suffering is of crucial importance because it shows that the God of popular theism does not exist. If you weaken the definition—maybe God is doing his best but he's not omnipotent, or he is omnipotent but he's not particularly good, or any other departures from the omnipotent-omniscient-omnibenevolent concept—then I'm an agnostic atheist. I strongly doubt such a god exists, but I don't have proof of that. Draws to the Dawn of Nothing--Oh, make haste! 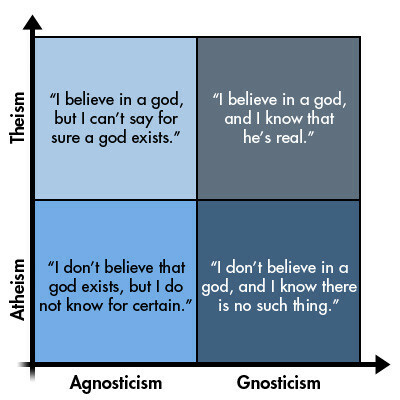 You cannot be an Agnostic Atheist because an Agnostic is undecided. You are coming over as 100 percent decided in your non belief so are presenting yourself as only an atheist. If you start entertaining the idea of a god or deity then you would be swinging towards being an agnostic. Off topic can be about that for sure but it can also be about sports, political matters or anything anyone wants to talk about. Surely atheism is also big time on debunking anything that is outside the realms of what science/evidence/research and logic offers. lanfear63 wrote: You cannot be an Agnostic Atheist because an Agnostic is undecided. You are coming over as 100 percent decided in your non belief so are presenting yourself as only an atheist. If you start entertaining the idea of a god or deity then you would be swinging towards being an agnostic. Most of us here don't believe that a deity exists (we reject the belief in the existence of deities, said in other words), since there's no scientific evidence/proof, but we don't claim to know for certain that it doesn't exist. That's the position of agnostic atheism. An agnostic atheist is defined as one who does not know for sure if any gods exist or not but who also does not believe in any gods. This definition makes it clear that being an agnostic and being an atheist are not mutually exclusive. Knowledge and belief are related but separate issues: not knowing if something is true or not doesn't exclude believing or disbelieving it. lanfear63 wrote: Surely atheism is also big time on debunking anything that is outside the realms of what science/evidence/research and logic offers. No, that's called skepticism. Skepticism is not atheism. Most atheists are not skeptics. MOST atheists believe in ghosts, and in some form of afterlife or reincarnation. Some atheists also happen to be skeptics towards those things, but that is not now, nor has it ever been, part of the definition of atheism. lanfear63 wrote: You cannot be an Agnostic Atheist because an Agnostic is undecided. You need to read the post I made in response to your claims. A person who claims to be only agnostic, whether or not he or she "knows" that a god exists or not, ALWAYS either has or lacks a belief in such a being. If you are not a theist, then you are an atheist. As I have explicitly explained, atheists as a whole DO NOT assert that a god does not exist, and do not actively disbelieve in a god. If you persist in claiming this, then that is dishonesty on your part, nothing more. Those people are atheists, just not skeptics. If you want to start a topic about "Can atheists believe in an afterlife?" or "Is a god required for an afterlife?" these could be started in Atheist vs. theist. You might even find a theist to argue with you, that in order to believe in an afterlife you must first believe in a god. If you just want to talk about your experiences, off-topic would be more appropriate a place to post it. Last edited by brimstoneSalad on Wed Jun 18, 2014 4:07 am, edited 1 time in total. Thanks for posting that brimstoneSalad. Where did you find that graphic? Interesting in what you are all all saying and and thanks for that graphic. It makes a clearer view of where you are all (or mostly) at. Has the view of all this shifted over the years though to where it is now. Is this the current consensus of all atheists, agnostics etc as to how it is defined? I seem to recall years ago that if you asked someone what happens when you die and they say you would just rot in the ground then that alone would class them as an atheist without any further questions in a lot of peoples views. So, the question is I would ask is can there ever be any true 100 percent pure atheists out there? I suppose a person who defines his atheist stance based on science and logic can never be 100 percent sure because he or she being of that type of person who embraces those doctrines would be rational and balanced enough to think well, however, I must still be open minded enough to embrace that science may one day uncover something that finds an as yet undetected dimensions or superfine energy/matter which could be evidence to the contrary of my stance. A person who just says nope, nothing out there, that's it, I'm an atheist could I supposed be called arrogant, single minded,, even ignorant for just denying anything just because he or she feels that way, which to the opposite extreme is just as bad as a religious god fanatic taking an ancient manuscript as the undisputed truth entirely on faith and live base his or hers life on it! I'm asking a lot of probing questions I know and do not wish to be rude, manipulative or provocative but wanted to see what your stance is on all this! lanfear63 wrote: Has the view of all this shifted over the years though to where it is now. A little bit. Language usage always shifts, though. In this case, as the term gained in popularity, and with new atheism, it has been clarified more. "gnostic" used to refer only to a an individual who subscribes to gnosticism (an ancient esoteric religious sect) as a noun; now it is also used as an adjective as a counter to agnostic (that may even be a more prevalent usage today). "positive", "strong", or "explicit" are also used instead of "gnostic"; "weak" or "implicit" are also used instead of "agnostic"
He was, however - and grudgingly - an atheist. He considered Agnosticism to be a methodology, not a belief in itself. Huxley wrote: I have never had the least sympathy with the a priori reasons against orthodoxy, and I have by nature and disposition the greatest possible antipathy to all the atheistic and infidel school. Nevertheless I know that I am, in spite of myself, exactly what the Christian would call, and, so far as I can see, is justified in calling, atheist and infidel. He didn't like to be called an atheist, but he most certainly was- even by its own admission. So, even from the moment of the coinage of the term "agnostic" it meant largely what it is used for today. lanfear63 wrote: Is this the current consensus of all atheists, agnostics etc as to how it is defined? Overwhelmingly, yes, it seems to be. Also, it's the correct usage as per its coinage, and as to its philosophical and logical meaning. A small minority of people seem to be under the mistaken impression that it's possible to be an agnostic all by itself. These people are widely regarded as being crazy people. Not knowing has nothing to do with belief. lanfear63 wrote: I seem to recall years ago that if you asked someone what happens when you die and they say you would just rot in the ground then that alone would class them as an atheist without any further questions in a lot of peoples views. That's inaccurate in a number of ways. Not only do most atheists believe in an afterlife of some kind, but not all theists believe in an afterlife- some people believe in a god, and believe that human life ends with death (in particular, some traditional Jews believe this, since the Christians kind of invented the whole afterlife thing based on Greek mythology- but they are not alone). lanfear63 wrote: So, the question is I would ask is can there ever be any true 100 percent pure atheists out there? Not all atheists are skeptics, and not all atheists believe in science, logic, or anything else. As I said before, most atheists believe in some kind of afterlife. Some people are atheists on religious grounds, based on faith- and they believe they have 100% knowledge on that subject. This is, for example, one of the dogmas of Jainism in my understanding. True Buddhists are also atheists, with regards to the monotheistic god concept; some accept the existence of devas, which are similar to gods but which are flawed and limited, and mortal, like humans (that is, not gods by any commonly accepted definition in the West). There is also solid logical foundation for rejecting with 100% certainty some god concepts, as cufflink correctly pointed out. You would have to investigate the philosophy more to really understand where some of those arguments are coming from. As one example: We can reject 100% the literal god of the bible, YHWH, because the bible says self-contradicting things about YHWH (which couldn't possibly be true). who never gets angry, and gets angry all of the time. Whose anger is fleeting, and eternal. Who can do anything, and can't do some things. Who never authors confusion, and also authors confusion sometimes. Now, not all people believe the bible is literal and perfect, and not all people even believe in the god of the bible. That's just an example of ONE god that we can be sure doesn't exist. If you change its properties to be logically consistent as far as we can tell, then it becomes at least apparently possible for it to exist (although in fact, it may or may not really be possible). There are people who do that, yes. There was one on this forum a few weeks ago. I believe he left though, when we didn't all agree with him. lanfear63 wrote: which to the opposite extreme is just as bad as a religious god fanatic taking an ancient manuscript as the undisputed truth entirely on faith and live base his or hers life on it! Well, that's debatable. There are some differences there, some subtle, some not-so-subtle. Also the fallacy fallacy. The fallacy that an argument is not valid because of a fallacy in it. We are all born Atheists, everyone of us. We are born without the Shackles of theism arresting our minds. It is not until we are poisoned by the fears and delusions of others that we become trapped in the psychopathic dream world of theism.